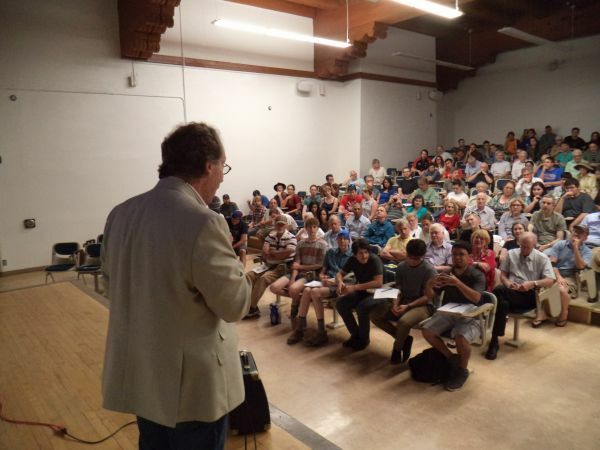 UNM's Maxwell Lecture Hall was filled to capacity for Dr. Lawrence M. Krauss's appearance at the CESE Annual Meeting on June 25th, 2016. It was a memorable event. Here follow some photos of the goings-on. A 275+ crowd is ready to hear Dr. Krauss (front, hat). Outgoing president Lisa Durkin addresses the crowd. The membership approved the new slate of officers for CESE: President: Jessica McCord; Vice-president/president elect: Jesse Johnson; Secretary: Dave Thomas; and Treasurer: Steve Brugge. 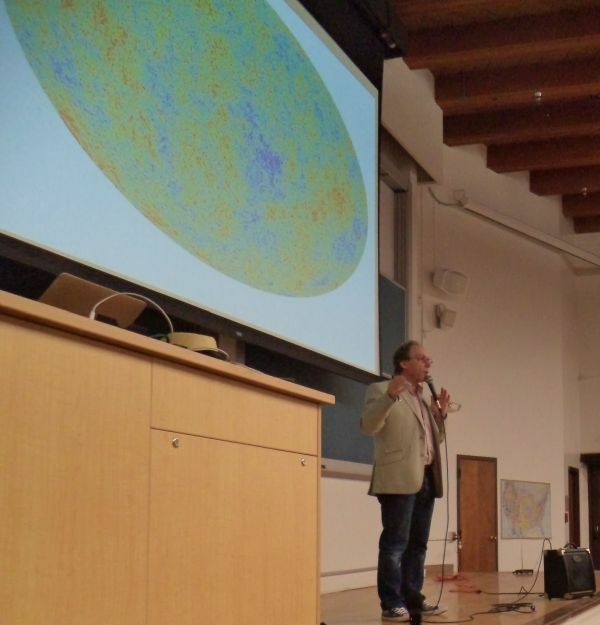 Dr. Krauss discussed several topics in physics and cosmology, including the Cosmic Microwave Background (shown), and the importance of the recent detection of the gravitational waves predicted by Einstein. A lively question-and-answer period followed the talk. 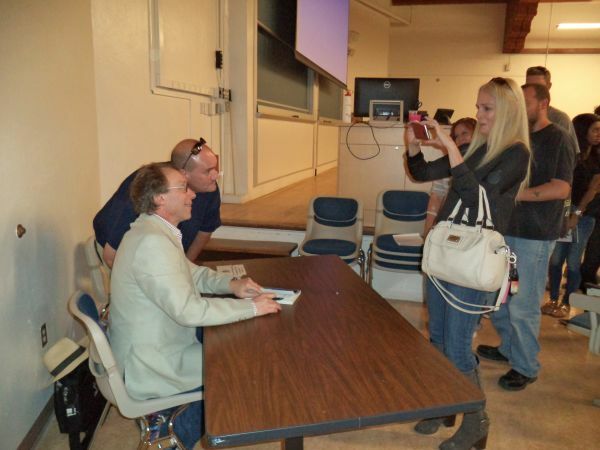 Dr. Krauss signed dozens of books, and graciously obliged requests for photographs as well. 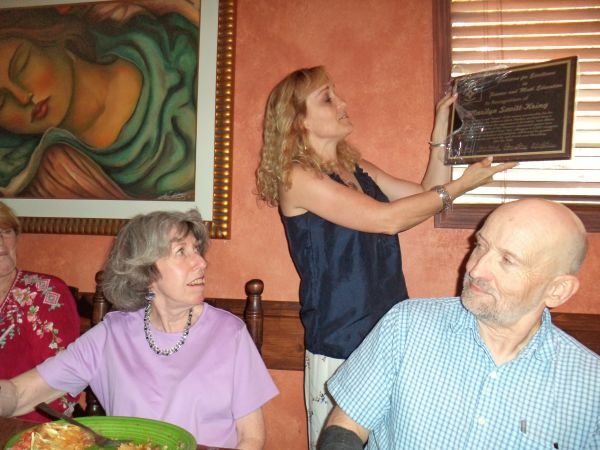 At a post-meeting gathering at Bruno's, outgoing secretary Marilyn Savitt-Kring (left) received a plaque of appreciation for her many years of service as CESE's secretary. The award was presented by Lisa Durkin; Mark Fraser is on the right. 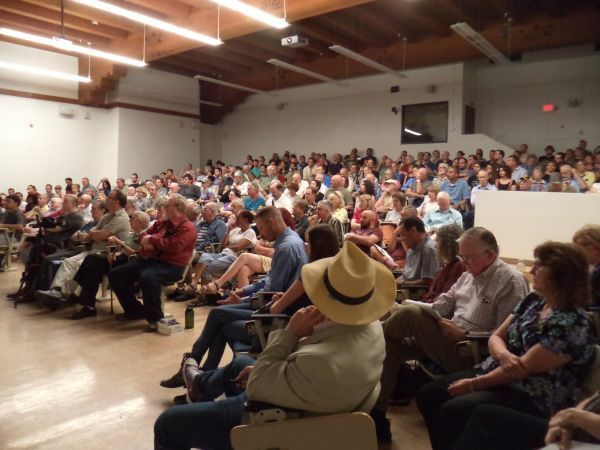 CESE Board meets President’s Baby » « Lawrence Krauss to speak at 1:30 PM Saturday, June 25th, for the CESE Annual Meeting!